Arctic.ru has organized a webinar on the satellite monitoring of the Arctic territories. Natalia Filimonova, head of the monitoring of the seas section at the ScanEx Research and Development Center, discusses the potential and designation of satellite imagery, environmental monitoring and other uses for the data. During the seminar, Ms Filimonova made a presentation and took questions from the audience. Is oil spill monitoring automated? Yes. On SAR images we see various phenomena including biogenic films, light wind areas and vessel traces. The program will process this data, and if we want it to, it can automatically highlight everything, including biogenic films and areas with calm winds. At the end of the day, however, we need an expert to have the final say based on his or her analysis and additional information. It depends on region of interest, and on how fast the receiving station will get satellite data. It takes from 20 minutes and more. The exact time also depends on the complexity of processing required. Sometimes in northern latitudes, the satellite is unable to locate the receiving station, which leads to delays of five to six hours. Are there websites showing oil spill monitoring in the Arctic online? We generally focus on a particular project, and we cannot launch a website with all the information we collect. However, at different websites you can find available satellite images. You can register at this sites and see the data. You can process them on your own. You included an email address into the last slide. If someone from the audience has any questions, they can send them there? Of course. You can always reach us, and we will answer your questions. Have you provided ice monitoring services to companies that were engaged in prospecting at licensed areas in the Arctic? If so, did you perform image analysis or just transmit raw data? Yes, we have covered exploration in the Arctic. We were responsible for a number of tasks, and our partners performed others. We have several clients in the region. We also conduct expert analysis and transfer our data to the clients. Suppose my company would like to perform round-the-clock ice monitoring in the Arctic. What can Scanex suggest for us? What software would we need to purchase? You can send your questions by e-mail. And we will send you all the detailed information and our proposals. You have mentioned radar and optical satellite images. The difference is noticeable. Why is one worse than the other? Both types are actually well-suited for different purposes. Optical images are clear to see and analyze. But it's not always sunny and cloudless. When the weather is not clear, radars are a solution. They can be used to obtain Earth surface information in any weather. 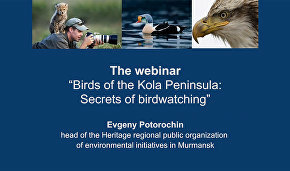 The first webinar on arctic.ru this year was dedicated to birdwatching on the Kola Peninsula. Head of the Heritage regional public organization of environmental initiatives in Murmansk, Yevgeny Potorochin, spoke about bird species, the best time for birdwatching and the prospects of ecotourism.